1. It’s fun and easy: When you chum around with people that visit your city, you’re not a tour guide; there’s no formal training; and there’s no need to memorize any boring scripts. You’re simply hanging out and having fun with like minded people you connect with on ChumAround. Based on the shared mutual interests you have with your guests, you can offer your personal perspective on the best places to go and see — things you’ll both enjoy! Just be yourself and let your guests discover the city you love. 2. 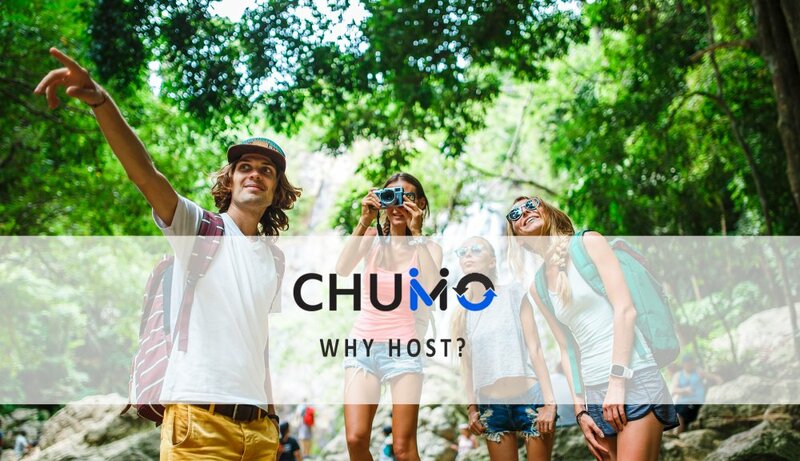 Work from any town, city, or village: Chumaround wasn’t created to simply connect people that visit popular tourist destinations. It’s designed to connect people visiting any town, city, or village in the world. It doesn’t matter whether you live in village with a population of a few hundred people or a large city with millions of residents, there are always visitors that need your help learning the local history, important landmarks, things to do, and best places to shop, eat, and dine. In fact, there’s probably someone visiting your city right now that could use your local knowledge and expertise! 3. Make money: One of the main draws of becoming a local host is that it can be a great way to earn some extra money whilst meeting new people and doing the things you love to do. Whether you are already engaged in full-time employment, are looking for something to fill a few empty hours each week, or see hosting as something you’d enjoy doing full-time, there is vast potential for money making as a local host. On Chumaround, you determine how much you want to make and can set your hourly rate accordingly. For every hour you’re out exploring and having fun, you’ll be earning. 4. Work anytime you want: Unlike with most jobs, hosting is extremely flexible and really works around you and your availability. You are completely in control of how little or often you work, although many hosts find that they build up such a good rapport with their guests and actually want to work more and more hours. 5. Meet people like you: The “Chumaround”:httsp://chumaround.com platform is designed in a way that encourages people with similar interests to connect. When you create your personal profile and host page, you will be encouraged to share things about your life, hobbies, and interests. This will make it easy for people that share similar interests to find and connect with you. When this occurs, not only will you be able to connect with like-minded people, but you will build deeper, more meaningful relationships with the people you hang out with.